Gantt Excel is a macro enabled excel file. It contains code that takes care of the automation so that you can easily create impressive Gantt charts. If macros are not enabled the automation will not work. A small prompt will show up with the message – Macros have been disabled (like in the image below). 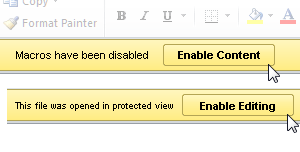 Note – You may also see another prompt that reads Enable Editing in some versions of Excel. You will also have to click on the “Enable Editing” button to proceed.